I am excited to show you a new dress design I am working on. This is the first prototype and it only needs a few modifications to make it just as I want it. 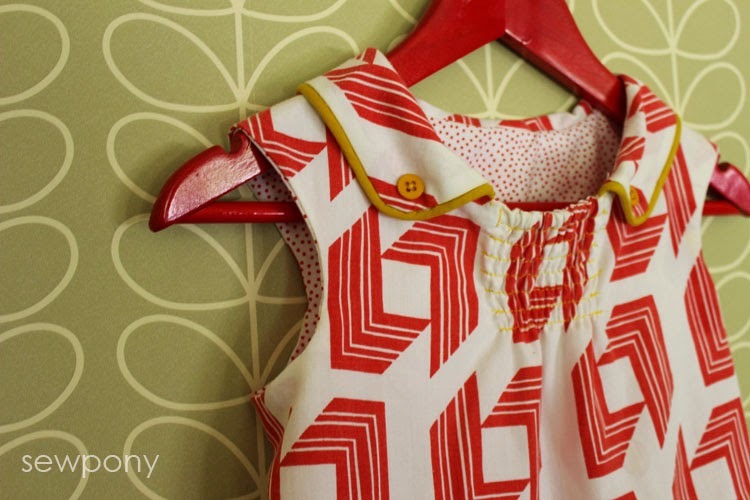 The dress features an open and piped 'eton' collar with small accent shirt buttons. An eton collar is a little like a peter pan collar but it sits up more where the collar and neckline meet. I made mine so that the collar fronts intentionally do not meet. 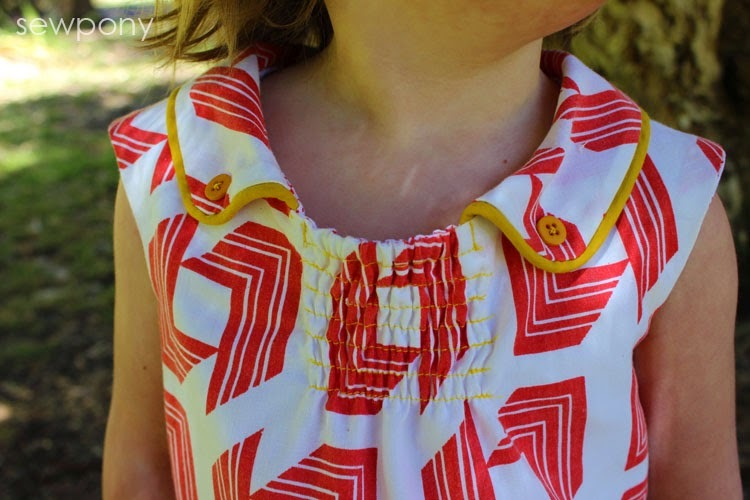 Between the collar fronts, the bodice is drawn together with an elastic casing (at top) followed by rows of shirring. The skirt is gathered in the centre front and has accent rectangular piped pockets. This version has extended sleeves. There will also be long sleeves for those of you approaching winter! Below you will see the back features another elastic casing to give some more shape to the dress. This will be one option for the back, and there will also be the option of a thin tie back. Emily is fairly short so I intend the finished dress to sit just on the knee. Have you noticed there are no closures? 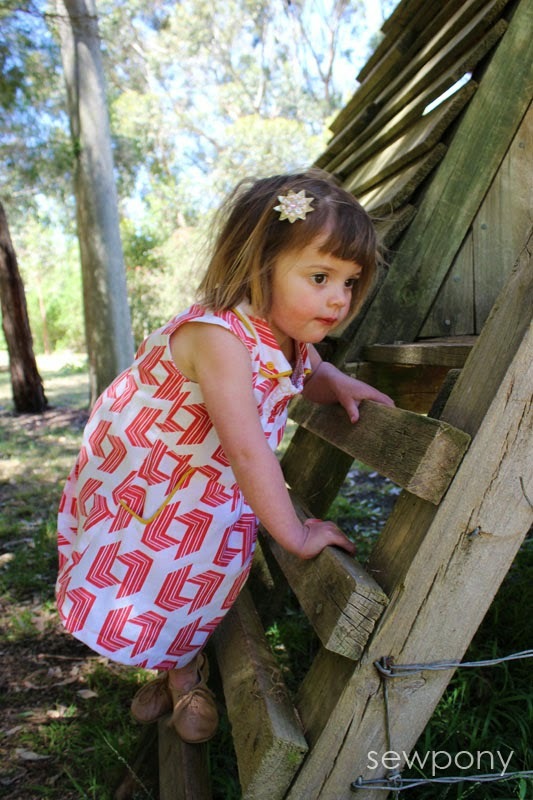 The elasticised neckline means you can pull the dress straight over the head. Easy to wear and comfortable to play in! The bodice front and back are lined. These are the small modifications I have made so far to the pattern I am drafting. I have raised the bodice line by 2cm as I want it to sit higher - this will elongate the pockets. 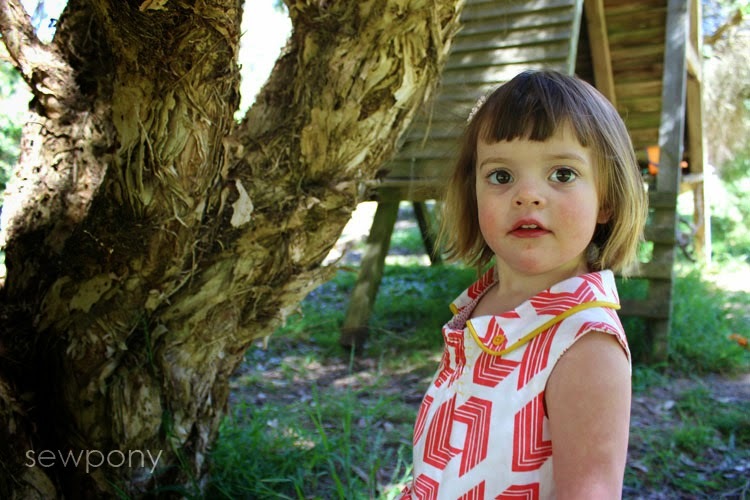 On future dresses I will cut the elastic in the top bodice casing shorter so it draws the neckline in a bit more. I have extended the line of the extended sleeve to make it a little more pronounced. This fabric is thrifted - a vintage bed sheet! The ochre piping is made from store bought bias binding. The lining is a Michael Miller spot I have had for a while (I don't remember the name). Do you like it? 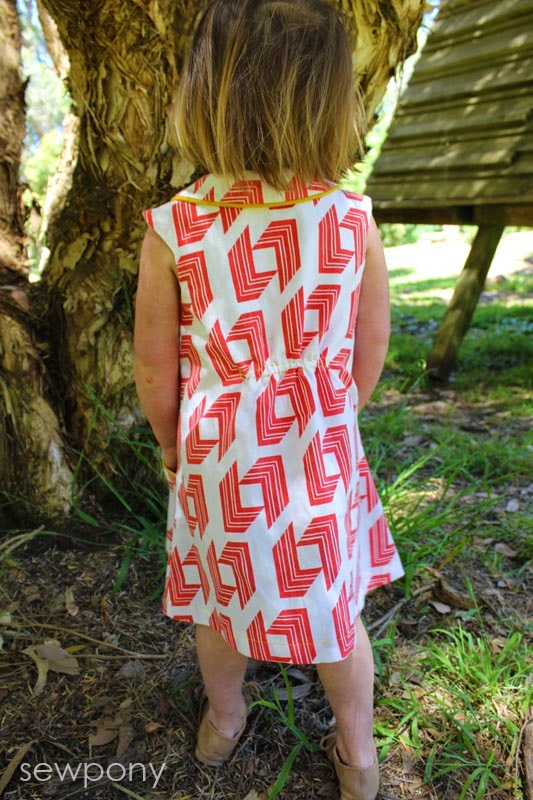 I am waiting on some cotton and steel fabric from Miss Matatabi to make up my next dress. Can't wait!! I do like it Suz :) No closures means certain independent little monkeys can get dressed themselves! I also love the extended sleeves. Emily is gorgeous :) She looks so much like her oldest sister! Those eyes!! Thank you Victoria! 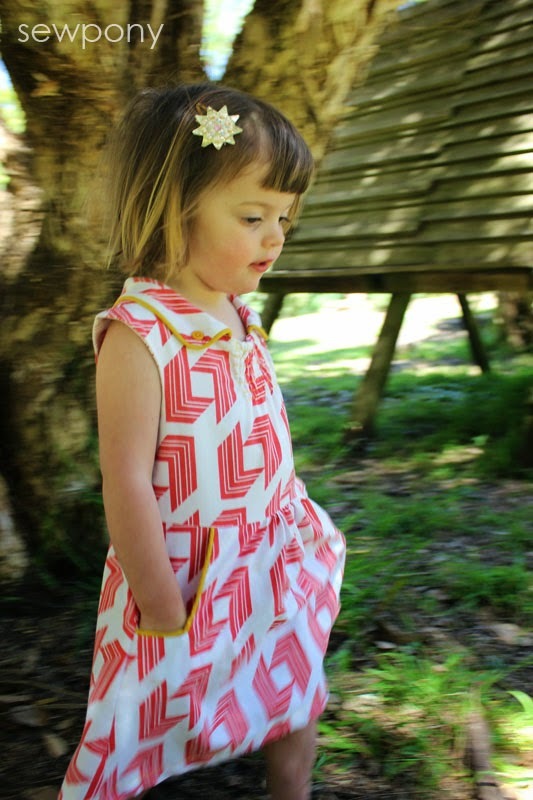 And I like your Idea of omitting the front seam and having a tunic option! Oh I love it, I love it, I love al of it!! I am a big fan of no button or zippers, I love those pockets and the collar also looks amazing. I absolutely LOVE it! Can't wait to make it!!! Wonderful to see something new and different. 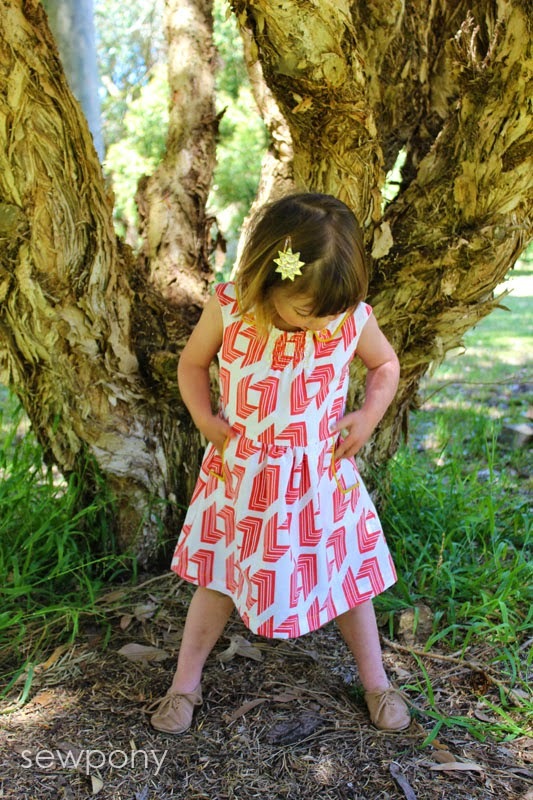 That is a very cute dress on a very cute wee girl. You did it again Suz! What an original dress!! I see a classic dress that has absolutly nothing boring about it! 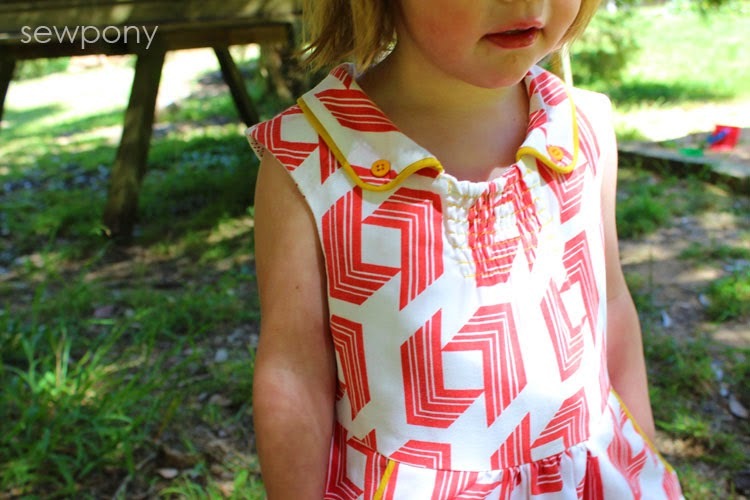 I ADORE the rows of shirring in the front! Thank you renee:) I am a regular op shop scout! I love, love , love it! It has such beautiful details! I'm curious to see the long-sleeved version as well. 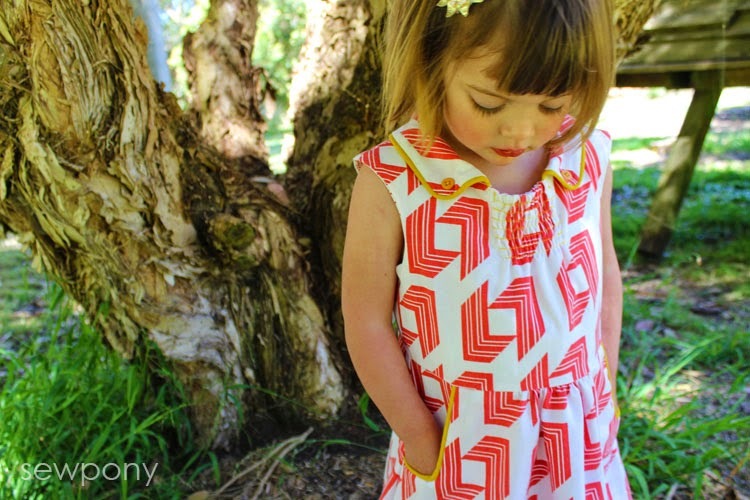 I love this dress and no closure system is a great idea, especially to dress two toddlers! The dress looks fantastic. I love that little ones can just pull it on. I look forward to seeing the final product after all the tweaks. The lining is simply called Pindots. I have a habit of hoarding the white on red colourway as it goes brilliantly in almost any type of quilt. Lovely and unique design Suz! 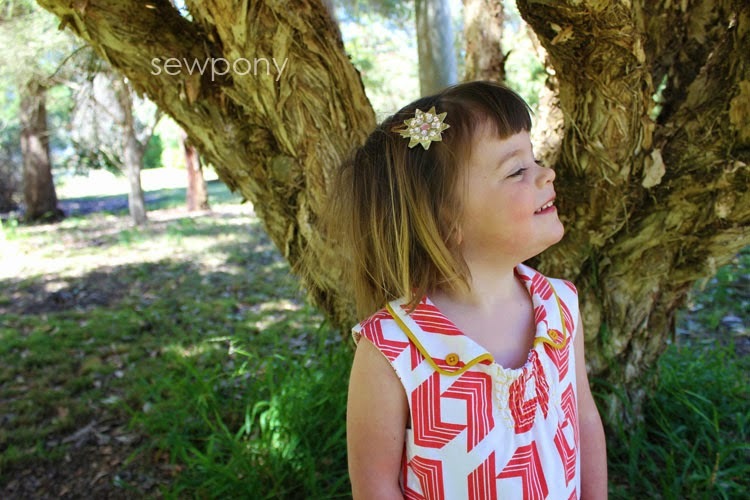 The collar is gorgeous and do is the fabric you picked for this dress! I absolutely adore this dress! Can't wait to make one myself!